Do you want to knit a pair of socks? Are you a sock newbie? A master at one pattern but want to change things up? Sock Club is your answer, together we will knit socks, provide help and support and cheer you on :-). I will discuss techniques and options pertinent to where you are in your sock(s) and spend time going over your individual projects. I can help you select a pattern, or work with the one you have. I have put a lot of thought into sock construction and techniques. This is a great opportunity to pick my brain. My pattern is available on Ravelry or in my Etsy Shop. Dragon Paws are ruffled hand warmers with optional beading. The ruffles are pointed and resemble a dragon’s wing - the optional addition of beads adds a touch of bling. You make them look perfect for a Wedding, Victorian, Steampunk, Goth or Raggey depending on your yarn and bead choices. They also look great without beads. Pattern available on Ravelry or in my (other) Etsy Shop. Pendants, and even a Handwoven Scarf or two (& more). ​There will be treats and raffles to add to the fun! 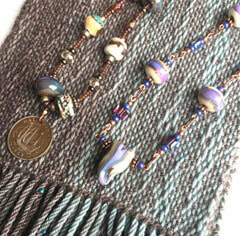 Pendants, Handwoven Scarves & more. A great little local Artisan Holiday Market with raffles and treats!